While email applications do the best they can to keep spam out sometimes the systems they use mistakenly consider legitimate mails as spam. So- We ask that you add us to your trusted list of senders, contacts or address book. This is known as 'Whitelisting'. If you do not see an email from Viral traffic tool in your Inbox, our email to you may have mistakenly been sent to your spam folder (or another folder your email application may use). If you are not sure how to Whitelist our email address on your email application / ISP we have provided detailed instructions on how to Whitelist our email address, however if you do not see your email application listed or your email application has changed the way to whilelist an email address, you can search Google for details. Click here for more information. NEXT: Click on the providers or software you use to see how to make sure you get the mail from FreeTraffic@a2zidx.com you have asked for. Step 3 If your email client or spam filter not listed above? If Viral traffic tool is being filtered, try adding FreeTraffic@a2zidx.com to your Address Book or Contact list. To make sure our email gets delivered to your Inbox, you must add Viral traffic tool to your contacts list. - If you see the email from Viral traffic tool: Open the Email. - Open the email from Viral traffic tool. - Click the drop down arrow next to "Reply" in the upper right side the email from header. - Click the 'Add Viral traffic tool to Contacts List' from the list that appears. 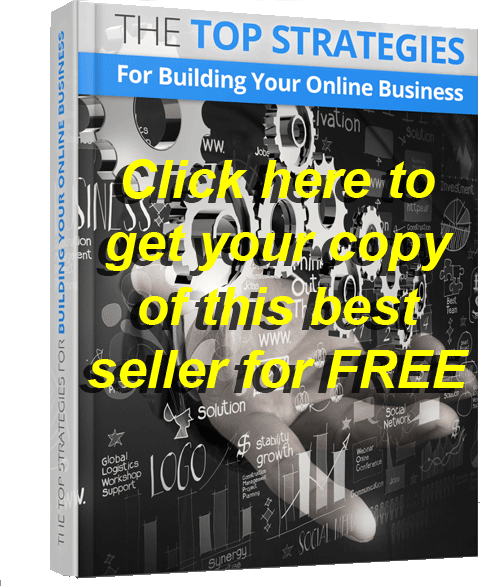 - If Viral traffic tool does not appear in the dropdown list? Then you probably have already added Viral traffic tool to Contacts. - If you are using the Gmail Mobile App on your mobile device, please open the app now. If you are using Gmail Tabs such as "Promotions" please open your Promotions tab in Gmail. Tap the menu icon - top right. Then select Primary from the list. NOTE: My Preferred Folder does not exist by default in Gmail. It is there as an example only since custom folders must be created by the user. - If you are using Gmail Tabs such as 'Promotions' please open your Promotions tab in Gmail. 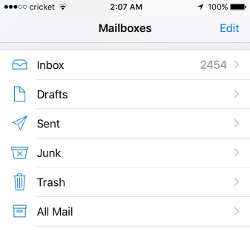 - Grab and drag my email to the Primary Inbox Tab. - After doing so, you will receive an alert like the one below at the top of your Gmail toolbar. The conversation has been moved to "Primary"
- Click Yes in the yellow alert box at Gmail. - Please open the email. - Next click the Not Spam button on the top toolbar. To ensure delivery: Create a filter to automatically send email from Viral traffic tool to your Inbox. - Move your mouse over or tap the Gear icon in the top right navigation bar. - Select Settings from the list that drops down. - Choose Filters located on the left side of the page. - Click the Add button on the Filters page. - Create a name such as Whitelist in the Filter name field. - In the From field leave the default contains selected. - Choose the destination folder to which you would like the message delivered. For example: Inbox. - Click or tap Save on this screen. - You will be returned to your Yahoo! Inbox. 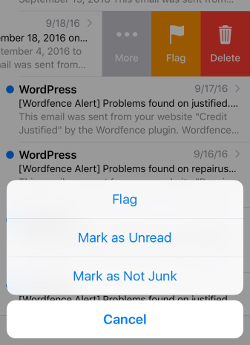 iPhone Mail identifies most junk mail (spam) sent to your @icloud.com address or aliases, but it can mistakenly move email to your Junk mail folder. Periodically check the Junk folder for email messages that were marked as junk mistakenly. - Select the Junk folder. 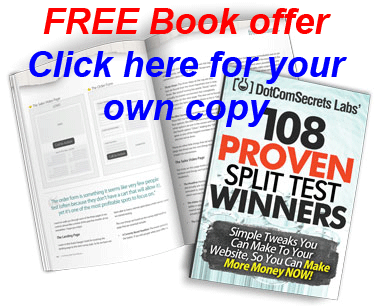 - Find the email from Viral traffic tool and slide it left to see options. - Tap the More button. - Tap the Mark button. - Tap the Mark as Not Junk button. The message is moved to your Inbox. Subsequent email messages from Viral traffic tool will no longer be marked as junk. 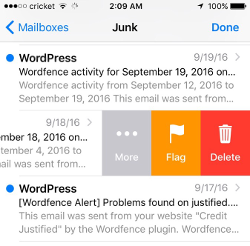 By default, messages in the Junk folder are deleted after 30 days so be sure to check it often to whitelist relevant email. - Click the dropdown menu on the top right of your Inbox. 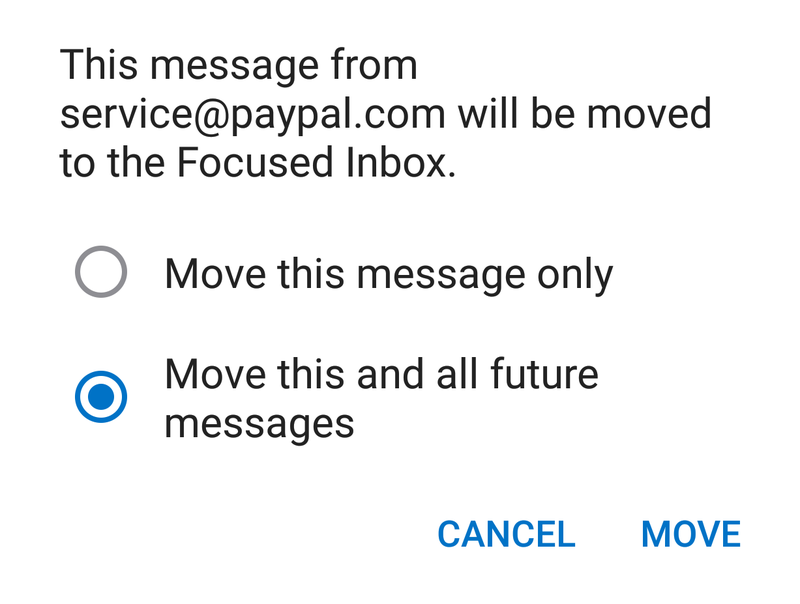 - Select the Move this and all future messages button. 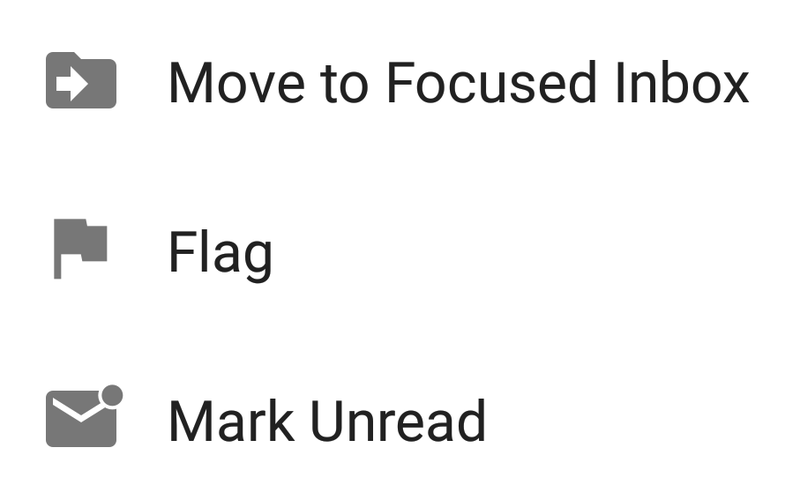 You can also remove unwanted emails from your Focused Inbox as well by repeating this process in your Focused tab. - Right click our email in your Inbox email list pane. 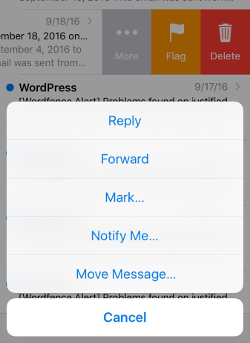 - Click or tap on Never block sender in the menu that rolls out. - "The sender of the selected message has been added to your Safe Senders List." To make sure our email gets delivered to a preferred folder or your choice in Inbox, you must add Viral traffic tool to your preferred folder, or a folder of your choice. NOTE: "My Preferred Folder" is a demonstration. You must create your own My Preferred Folder by clicking + Create New yourself. Please check your Inbox Spam Folder or your Promotions bundle:. - When you see the email from Viral traffic tool: Open the Email. - Then click the icon. - Next please add Viral traffic tool to your My Preferred Folder. - If you have not already created a My Preferred Folder, you may do so by clicking "+ Create new..."
- You may also move Viral traffic tool to any folder of your choice. In the new Outlook.com you must click the Wait it´s safe link if you find emails incorrectly identified as spam. Entering the email contact in the address book or contacts no longer whitelists the sender. Mark Sender as "Wait it´s safe!" Microsoft SmartScreen marked this message as junk and we´ll delete it after ten days. - Click gear the icon on the top right. - Select Options in the drop down list. - Click the link Safe senders on the next page. - Enter the email address FreeTraffic@a2zidx.com in the text box. - Emails added to your Safe senders will not be delivered by mistake to your Junk folder. Click "Not spam" in the resulting list. - Click the show details link next to Viral traffic tool in the From field. - Move your mouse over or tap FreeTraffic@a2zidx.com to show the menu. - Click or tap Add contact in the menu displayed. Click the Spam (not spam) icon on the top toolbar. - Please open the email from Viral traffic tool. - That will open your edit contact screen. - Then click Save and you´re all done. 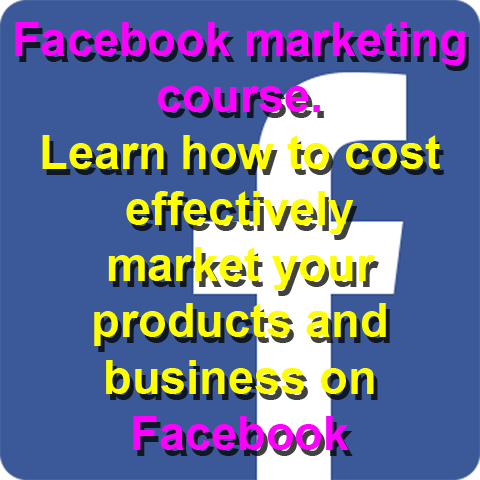 - Add Viral traffic tool to your address book. - Select the Move to Inbox and Add Contact option from the drop down menu. - This will add FreeTraffic@a2zidx.com to your Address Book for future email delivery assurance. - Click Add to Address Book in the email header. - Use the Address Book Editor to verify the sender´s contact details and click save. - Fill in FreeTraffic@a2zidx.com as the email address of the sender. - Any mail sent with the same Domain (right of the @ sign) will now be delivered to your Inbox. AT&T no longer maintains their own inbox. Please follow the Yahoo instructions for whitelisting an ATT.net email address. Please mark that message as Not Junk. - Click the Address Book button. - Make sure the Personal Address Book is highlighted. - Click the New Contact button. - Under the Contact tab, copy and paste the 'From' address, FreeTraffic@a2zidx.com into the email text box. This problem may happen if FreeTraffic@a2zidx.com is accidentally added to the Blocked List. - Start your Norton product. In the Settings window, under Detailed Settings, click AntiSpam. On the Filter tab, next to Blocked List, click Configure. In the Settings window, on the Network tab, click Message Protection. Under AntiSpam, next to Blocked List, click Configure. - In the Blocked List window, select the item that you want to remove, and then click Remove. - Click Apply, and then click OK.
- If you do not find FreeTraffic@a2zidx.com in the Blocked list, go to next step. On the Filter tab, next to Allowed List, click Configure. Under AntiSpam, next to Allowed List, click Configure. - In the Allowed List window, click Add. - In the Add Email Address window, from the Address Type drop-down, select the address type. - Add FreeTraffic@a2zidx.com, and then click OK.
- In the Allowed List window, click Apply, and then click OK. While McAfee has removed spam protection in the latest Anti-Virus software- You may still have a version that offers spam filtering. In order to add Viral traffic tool to the friends whitelist, please open McAfee and click on Web & Email Protection. There you can see various settings. You can change the spam protection level, change filter settings, etc. - Please add FreeTraffic@a2zidx.com to your 'Friends List' to always allow emails from Viral traffic tool. If you received an email message that was incorrectly moved to the Spam Mail folder by the Anti-Spam Toolbar you can prevent this from occurring in the future. The Anti-Spam Toolbar detects spam by looking for certain keywords in the email´s subject or body. Occasionally, it may detect what you consider legitimate email as spam. - Add the Viral traffic tool to the list of Approved Senders. 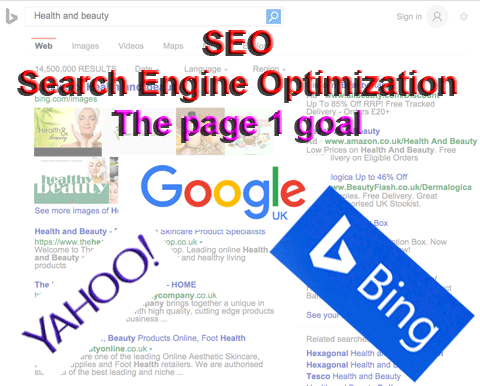 - Decrease the Spam Email Filter Strength. Note: You can also select the email and click Not Spam to report it to Trend Micro. However, this feature serves only as a reference to their spam database, and it may not have an effect on how the toolbar detects spam. - Click the Spam Mail folder then select the legitimate email detected as spam. - Click Approve Sender on the toolbar. - Click Yes when the confirmation message appears. - Click Trend Micro Anti-Spam then click Settings. - On the Spam Filter tab, move the slider bar to select a lower filter strength. - Click OK to save your settings. - Select Cloudmark | Options... from the Cloudmark SpamNet toolbar in Outlook. - Go to the Whitelist tab. - Click the Add button. Sanebox is not a filter, but a filtering system trained by you. - Open your Webmail or Gmail where you use SaneBox. - Open your @SaneLater folder. - Please drag my email to your Inbox folder. - By doing this you will always get our great content in your Inbox from now on! - Save the user_prefs file or move the updated copy to your .spamassassin subdirectory. Occasionally, Barracuda Spam Firewall will mark a legitimate message as spam. There are two methods to whitelist email senders. - Open your email client. Barracuda should send you a summary each day listing quarantined items. Choose the most recent Barracuda email message. - Locate the email from Viral traffic tool and the sender email address FreeTraffic@a2zidx.com that you do not want quarantined in the future. Click on the word 'Whitelist'. which is in green print to the right of the email title. This will open your list in a web browser. - Click the box to the left of the email that you would like to whitelist. At the top of the page, click "Whitelist." Barracuda will not block or quarantine the sender whose email address appears on the whitelist. - Open your web browser. Navigate to your company´s Barracuda firewall homepage. - Click on the Block/Accept tab. - Choose 'Sender Domain Block/Accept'. Enter the Domain name from FreeTraffic@a2zidx.com to whitelist. For example, you can enter aol.com to allow all AOL addresses. - You may enter a comment to remind you why you allowed this Domain. Click 'Add'. - Include a comment. Click 'Add'. In the future, Barracuda will not block emails from this sender. Highlight the email from Viral traffic tool with the email address FreeTraffic@a2zidx.com to Whitelist. Click 'More' in the SPAMfighter Toolbar and select 'Whitelist'. Here you can choose if you want to Whitelist the email address FreeTraffic@a2zidx.com or the whole Domain. - Click 'More' in the SPAMfighter toolbar. - Click "More" in the SPAMfighter toolbar. - Then "Blacklists & Whitelists"
- Click Tools, then Blacklist & Friends. - Click Add... on the right, the Friends list side. - Make sure Plain email address is selected. - Choose "Approve another Sender"
- Select File, then Configure. - Go to the Friends category. - Make sure Active is checked. - Type: FreeTraffic@a2zidx.com on a line by itself in the entry field. If your email application is not covered above or the methods used have been changed you can do a Google search (or a search on any other search engine). Search for How to whitelist an email address on followed by the name of your email application (or a similar search phrase). Viral traffic tool is in no way associated with any of the brands, websites or applications quoted here. All Trademarks ® are the property of their respective owners. These instructions are based on the original version that you can view here however we found a number of coding errors in the original version (it looked ok on the browser I checked it on but it is not good to have pages with errors on your website and it will probably not display correctly on all devices / browsers), so we corrected the coding errors and made it HTML 5 complient. We plan adding a code generator here, so that you can create your own personalalized version that you can use on your own website. For more information on when this will be available please contact us. While we hope that the information has been of help to you; we appreciate that everyone´s requirements are different and invite you to view our Frequently asked questions or contact us if you have questions about this website. © Copyright 2016 a2zidx.com No information contained on this site may be copied by any means or used for any reason without prior written permission.